There are many television shows with massive budgets that manage to skimp on the additional content when they come to DVD and Blu-ray. Yet somehow a show with an introductory episode that cost less than $100 to produce always comes through when it hits the discs. That high standard is still there in It’s Always Sunny in Philadelphia: The Complete Season 6. The Gang at Paddy’s Pub returns for more shenanigans in the sixth season with their adventures horrifyingly offensive, or outrageously offensive, depending on your sensibilities. The new adventures kick off with wedding bells as Dennis (Glenn Howerton) gets hitched and Charlie and Frank (Charlie Day, Danny DeVito) weasel their way into a crooked domestic partnership. Things just get crazier from there as Mac (Rob McElhenney) makes an attempt at sports immortality, the group revisits old friendships and strives for new career goals, all leading up to the finale with the pregnancy of Sweet Dee (Kaitlin Olson) coming to fruition sans a father. All the while, not a minute goes by in Philly without this quintet making their mark. Howerton, McElhenney and Day have yet to disappoint as one of the greatest trios in TV history — high-level narcissist Dennis, sleeveless wonder macho man Mac, and well-meaning dim bulb Charlie. Factor in DeVito as diminutive sleaze ball Frank, and you’ve got yourself a recipe for great comedy. Olson receives a greater share of the spotlight as Dee in the newest season, suddenly with child — to coincide with the birth of Olson’s and husband McElhenney’s real-life son — and striving toward a career in molding young minds that goes awry, as with every venture. 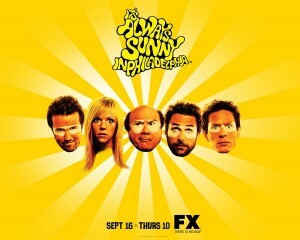 Also returning are favorite characters such as the heretofore unnamed waitress (Mary Elizabeth Ellis), disgusting semi-mutants the McPoyles (Nate Mooney, Jimmi Simpson, Thesy Surface), homeless train wreck Rickety Cricket (David Hornsby), Mac’s gender-switching ex, Carmen (Brittany Daniel), Charlie’s creepy Uncle Jack (Andrew Friedman), and more. An extra feature with “legal advice” from Uncle Jack is one of many of the typically gut-busting bonus materials for which “It’s Always Sunny” has gained a reputation. Although there is still the glaring omission of the show’s Christmas special within any of the regular season DVDs, there’s still a lot to enjoy. A string of deleted scenes, bloopers, and multiple audio commentaries are only the beginning. Dennis and Dee’s characteristically inane podcasts about current events are worth a few laughs, as is the full version of Lethal Weapon 5, complete with Mac and Dennis each playing both Riggs and Murtaugh, one in blackface, one without. The inclusion of the pilot episode of Wilfred also brings to mind how It’s Always Sunny has set the stage for FX as a remarkable presence in the humor world of basic cable. The show’s advent has since led to great comedy programming like Archer, The League and Louie, just as The Shield helped bring us dramas such as Nip/Tuck, Rescue Me, Damages, Justified, and the new American Horror Story. It’s Always Sunny in Philadelphia: The Complete Season 6 comes at just the right time with a new season already underway. Seeing as lucky number seven promises plot points such as The Gang’s high school reunion, massive weight gain for Mac, tax problems for Dee and Frank’s endeavor to romance a streetwalker and get into the world of child beauty pageants — separate schemes, thankfully — it looks to be sunnier than ever.